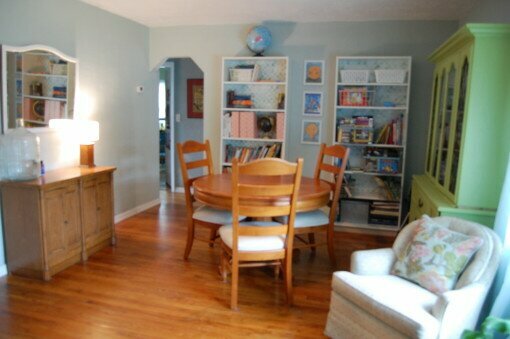 Earlier this spring we converted our dining room to a “learning room” by removing the leaf in the table and moving in some comfy chairs and bookcases. We moved most of J-Man’s books in there along with his Littlebits, telescope, and some of the other learning games and tools that he has. I cleaned out the china cabinet to make room for new collections and art materials, and made space for our laptops. I hung some of the little Leonardo’s art pieces and thought I was good to go. He loved it. He is in there all the time. He pulls books out, often reading three or four at a time. I should have been happy with this. The thing is, I am home all the time now (well when we’re not at a museum, aquarium, park, nature walk, gymnastics, or a meetup with other homeschoolers or unschoolers). Being home more has allowed (forced?) me see where some definite improvements could be made. On top of this, we live in a small house, and this room is right in the middle. I know that if this room doesn’t work well and look good, it will not bode well fo r this endeavor. Here is what we look like today. Note: that I did not straighten up for this shot. The messy and unorganized begining. Setting aside some of the bigger projects, my first thought was how best to organize materials, leaving space for adding materials as we get going. Thankfully, I have never been let down by a trusty Pinterest search! Here are some amazing inspiration photos. 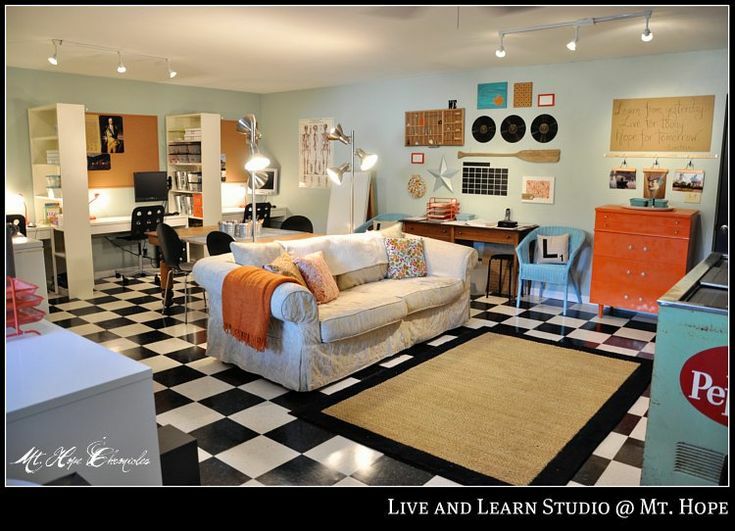 This next one is from Live and Learn Studio from Mt. Hope Chronicles I don’t even know what to say about this. I love the space, color and the feeling like learning and living are going on here. 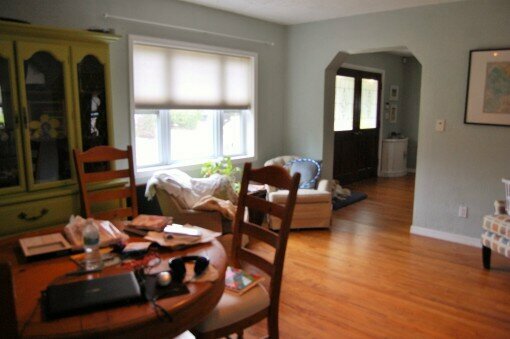 Love everything about this room, but don’t have anything like this much space. 1) Comfy-this is still our house and we are homeschooling for a reason. I don’t want to lose the comfortable feeling of beeing at home, so I want it to feel homey and comfortable. 2)Organized-I can’t function in a space that is chaotic, and I certainly can’t be creative there. I want everyting to have a place so that we feel good about coming in here, even if we do the actual learning at the park or the museum. 3)Bright and cheerful-Many years ago, when I was a reading coach in Jacksonville, we did a survey of our students to find out what makes the model classroom. After organized and clean, every single child said colorful. This is important because it was a middle school and many secondary teachers were under the mistaken impression that kids didn’t care about dressing up the classroom anymore. A colorful environment can be cheerful and inspiring. 4)Full of resources-Sitting the boy down and saying this is what we are going to learn today, is not going to work. He would do far better with that approach in a school setting, as he, rightfully, does not really see me as a teacher. What work for me is to just pull out a couple of materials and leave them where he can find them. Sandra Dodd calls this “strewing” and it works. This can only work if you have the materials and resources to “strew” around the room. I am currently working on a Minecraft themed unit with rock collecting and geography. I plan to put together a collection of some of the rocks he sees in Minecraft, along with some books on rocks, and some story starters. 5)A place for me to work while he is working and keep my homeschool materials. What I’m working with is two white bookcases from IKEA, a green china cabinet,two club chairs and an arm-chair. We have a buffet that is about to be moved in favor of two new cubbie units. I thought maybe it would help us fit more materials in our small space if we sorted books in baskets and bins by topic. While, the room is not completely done, the process made me realize how science heavy our collection is. J-Man loves science, which is a good thing, but we also want him to be well-rounded, so we need to support other interests with as much vigor, as they arrive. Our room after a little organization. Another view of our study room. Soon to be painted cabinet to hold manipulatives and supplies. 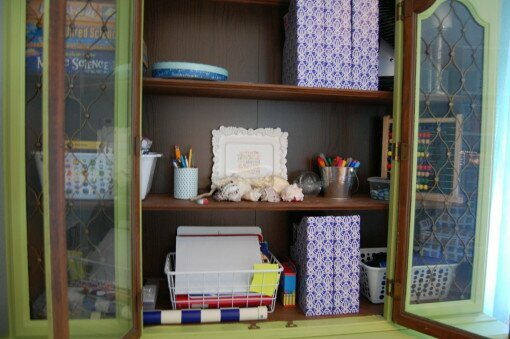 The cabinet is an extra space for magazines, notebooks, and math and science resources. The key for me was to make sure all of our resources were easy to find, but looked attractive as this room is open to the living room. 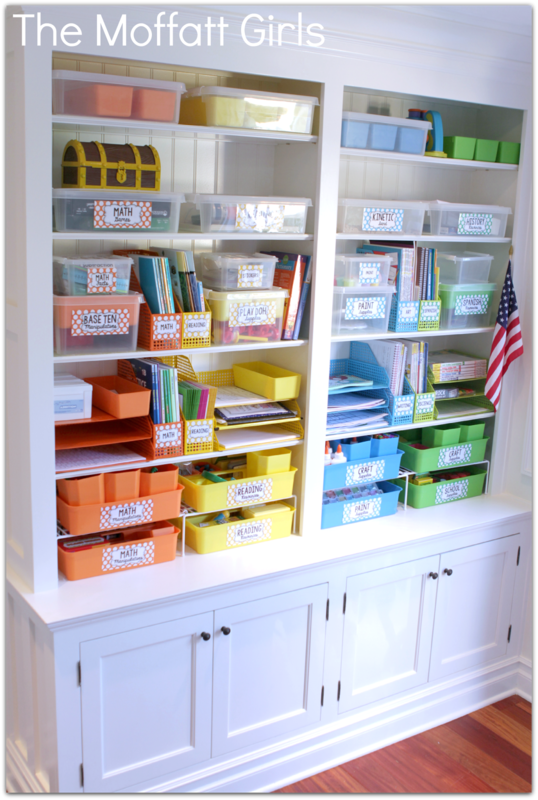 So, all I really added were the magazine file boxes and white plastic bins I purchased at the Dollar Tree and the wire bins I purchased at HomeGoods. I took out more than half of my teaching resources as they won’t apply to us anymore, and removed all the duplicate Captain Underpants books (apparently the family did not coordinate purchases and J-Man had two copies of each). As I straightened organized and rearranged took inventory on some things I will add over time. I would love a soft rug and better lighting. The rug will give the room warmth and make the reading area more cozy, while the lighting will make it possible for this old woman to read better. I would love to put up a large whiteboard. That way J-Man has a larger space to do his MinutePhysics inspired drawings, and I can have a space to use something like a Smartboard (apparently you can make your own with a bluetooth, a Wii remote, and a stand–more on that later). More fiction for sure. We are seriously non-fiction heavy here. J-Man has been royally in to Roald Dahl lately, so we’ll probably add to his collection. He likes to read stories, so I am thinking about some Aesop’s Fables and Mythology. Overall, I really like the progress we have made. I know he already used the space all the time, but I think he will really like the updates, and I know I will love spending time in here. 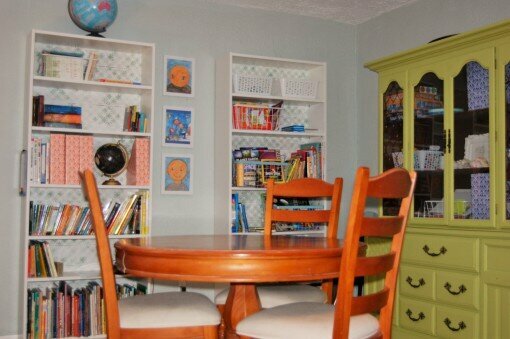 So, if you could do anything to your homeschooling space, what would it be? What would you add or take out?